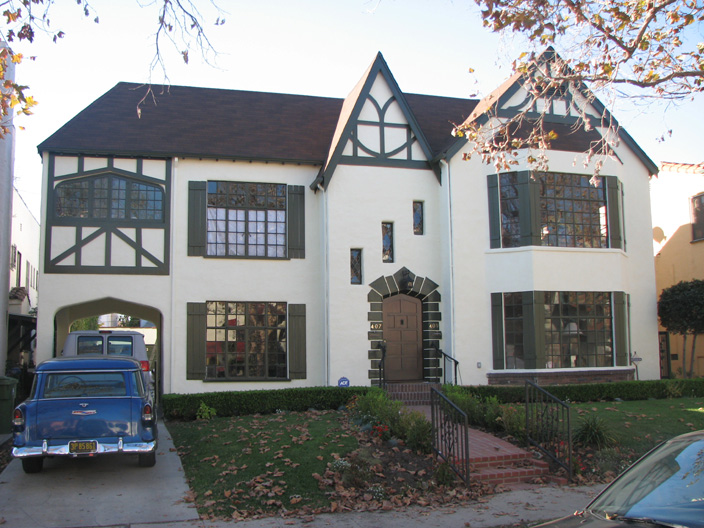 This duplex is a unique English Tudor Revival structure that was designed by Paul Stockigt, a German immigrant who worked as an architect/carpenter using skills that he learned in Europe to create well-designed and executed buildings that exhibit his own craftsmanship. The fine craftsmanship of the exterior and interior elements gives this structure a distinctive design that is emblematic of a period that true craftsmanship was found among many who learned it either by apprenticeship or having handed down from one generation to the next. Oliver Flats is a work of art in every sense of the word. This house emblematic of the types of revival styles that began around the First World War and flourished during the 1920s and 1930s. This was a period where artisans came to Los Angeles and were involved with the construction of many of the area’s important landmarks, such as the stone Gates to Hollywoodland and much of the high quality carpentry and details that went into the homes of the Hollywood elite. Oliver Flats possesses numerous original and unaltered examples of this type of work. Born in Germany, Carl Emil Paul Stockigt carried his German native craft traditions, though he was trained and employed as an accountant in England, Canada and the United States. However, it appears that his purchase of a Pacific Ready-cut kit house when he first came to Los Angeles, in 1923 was what again awakened his creative ability, causing him to embark on a new career in design and carpentry at the age of 45. What his educational background was is not known at this point, and whether he learned his drafting skills in Germany or at a school in the United States, Oliver Flats shows his ability to produce a quality design. His carpentry skills were most likely learned in Europe, possibly through his own family. Again, the quality and unique design of the finish work found in Oliver Flats is consistent with the best of the Old World craftsmen that brought their skills to our shores. Oliver Flats displays the commitment to detail and the purity of design that makes it stand out among its contemporaries. It stands as a reminder of both the quality of construction that was wrought during the 1920s.